Most of us are familiar with optical illusions. An optical illusion is a visual trick played on the mind using an image that is perceived in a way that is different from what it is in objective reality. Our brain processes what it sees, and fills in the gaps using the knowledge from past experiences. “Hlelo hwo aer yuo dinog tadoy? 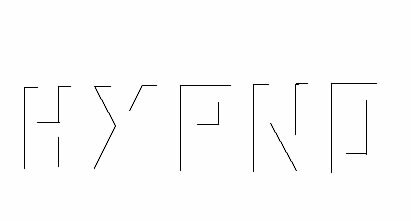 You can see quite clearly that it says the word “Hypno”. However half of the lines are missing that make up the letters. Your brain is quite literally filling on the missing lines. If you look carefully, you can almost see them like they are there! Over millions of years we have evolved to notice differences, such as movement within motionless trees, and to be sensitive to context. These abilities have been so important to our survival that it is very difficult to override them. 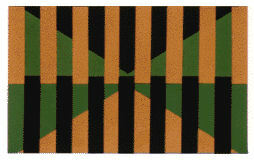 In figure 1, the shade of green in the top half is exactly the same shade as in the bottom half. Yet they look different. If you isolate the colours with your hand or with some paper, you can see this. However your brain will still automatically perceive them as different, even when you know they are the same. Looking at figure 2 the second circle appears larger than the first circle because of the different contexts they are both placed in. 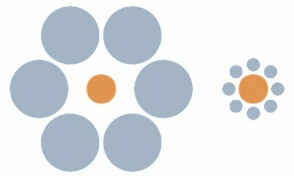 In the first context the circle is made to appear smaller because it is dwarfed by the bigger blue circles, whereas in the second picture the circle seems bigger as you are comparing it to smaller circles. We go about our life experiencing only a small fraction of the ‘reality’ that going on around us. The brain fills in many aspects of what is going on based on past experiences. For example if you were attacked by a dog in your past, the brain may interpret a dog running up to you in a friendly way as an act of aggression, causing you to feel fear. However the same dog running in the same way to someone who has had loads of good experiences with dogs, will probably perceive this quite differently. They may even perceive an aggressive dog as being friendly! Our brain organizes and constructs our own personal and unique realities. Because they are ‘our’ reality, we often believe them to be THE ‘true reality’. This can stop us from growing and learning, and changing our ways. For example some people due to a negative past experience may go through life feeling that people cannot be trusted. They will continually interpret other people’s actions as confirming this belief, further strengthening their resolve. You can literally get into a negative cycle where you look for a problem and find it, which strengthens the belief each time. Hypnosis sessions can help expand your perceptions of reality, allowing you to experience a little more of the ‘reality’ of what is around you. Hypnosis can challenge your existing views by offering your subconscious mind alternative viewpoints. This can have the effect of opening your mind to other realities, helping you to move closer to the ‘real you’, and ‘reality’ by giving you a choice of other alternatives. It can help break you from any ‘mental rut’ you are sitting in. As I have already said, the reality you have constructed in your own mind is not the same as anyone else’s. We all have a unique perception of life. Some may perceive life as exciting, challenging, and rewarding; whereas others may perceive it as cold, cruel, and hard. Yet we live in the same world. Luckily the mindset can be changed with hypnosis. For example before a dog phobia hypnotherapy session, you can show a person a picture of a dog and asked them from 1 to 10 what fear is evokes. They typically score the fear quite high – maybe 7,8 or 9. After the session they still feel “normal”. However when they score the fear from the same picture again, they may score it 2 or 3. Sometimes you have to remind them what they previously rated it, because the low score now just feels normal and natural. Sometimes they even need convincing that you have not switched the pictures! Hypnotherapy is a a technique that is used to communicate with the subconscious mind. When a person is in a trance, they are really just in a focused state of relaxation. This is similar to daydreaming or even when deeply engrossed in the TV (which is why TV advertisements can be very influential). You are sort of ‘zoned out’. It is a natural state of mind – there is nothing magical about it whatsoever. In a trance, a good hypnotherapist can talk to the subconscious mind and convince it to change. This is far more powerful than a conscious conversation as all our habits and phobias reside in our subconscious mind. That is why a person with spider phobia can consciously agree that it is an irrational fear, but still be fearful. The subconscious mind triggers the automatic fear responses, and it cannot be overridden consciously. What is needed in most cases is changing the subconscious mind. So if there are any things that need altering in your perception, then hypnotherapy is a good quick way of achieving this. It is great for confidence issues, phobias, weight loss, addictions, relationships, and many other things.